Cellist Mark Rudoff has demonstrated extraordinary versatility as a performer and teacher. Students in the Ohio State cello studio share in an eclectic pedagogy, with influences ranging from legal discourse to sports, liberally spiced with passion and humor. Cello at Ohio State is about preparing the complete artist with musical, technical, intellectual and personal skills to bring their music to the world. Applauded by critics as "an exceptionally gifted cellist" and “a charismatic performer,” Rudoff has performed in solo recitals and with orchestras in Canada and the United States, and his solo and chamber performances have been recorded for broadcast on CBC. A respected chamber musician, he performs with the Galileo Trio and Chiarina Piano Quartet, and has performed as a guest with groups including the Music Project, Allegri Quartet, Marble Cliff Chamber Players, Mount Royal Woodwind Quintet, and Thomas and Isobel Rolston and Friends. Equally accomplished in the orchestra sphere, Rudoff has served as principal cello of the Calgary Philharmonic and Saskatoon Symphony Orchestras, and in the sections of orchestras including the New York Philharmonic, Brooklyn Philharmonic and New York City Ballet, performing under such conductors as Leonard Bernstein, Zubin Mehta, Kazuyoshi Akiyama, Lukas Foss and Aaron Copland. Rudoff has appeared as guest artist with the Canadian Chamber Choir and at the Winnipeg Symphony's Centara New Music Festival, New Music North, and the Grand Teton Music Festival. Prior to joining the Ohio State faculty, Mark Rudoff was professor of cello, chamber music and orchestra at Brandon University in Manitoba, Canada. 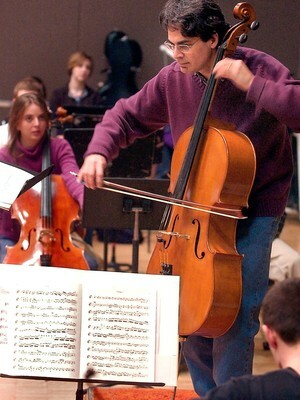 Away from Ohio State, he teaches cello and chamber music at The Castleman Quartet Program in residence at SUNY Fredonia, and in recent years has been invited to teach and perform at festivals including The Florentia Consort Renaissance in the XXI Century, Zephyr International Festival, and Interlochen Summer School of the Arts. He has delivered presentations on performance and pedagogy at the American String Teachers Association and College Music Society National Conferences, and students throughout Canada and the northern U.S. have enjoyed Rudoff’s work as an adjudicator and workshop clinician. In 2018, he was appointed music director and conductor of the Cincinnati Community Orchestra. Rudoff earned bachelor and master of music degrees from The Juilliard School, graduating with the Edward Steuermann Prize. He studied there with Harvey Shapiro, Lynn Harrell, Lorne Munroe and Joel Krosnick, and was appointed teaching assistant to the Juilliard Quartet. He later held a residency at The Banff Centre for the Arts, pursuing advanced studies with artists including Paul Tortelier, Anner Bylsma, Wieland Kuijken, Siegfried Palm, and Witold Lutoslawski. Rudoff also holds a Bachelor of Laws degree from the University of Saskatchewan, where he was appointed to the editorial board of the Saskatchewan Law Review and graduated with distinction in 1990. He enjoys the odd distinction of having published an article about music in the Alberta Law Review, and one with a legal slant in American String Teacher. “Lenny and Nino: Leonard Bernstein and Antonin Scalia Argue Interpretation Theory and Practice.” Invited presentation at Public Music Discourse: In Honor of the Bernstein Centenary, 2018 Conference at University of South Carolina. “Secrets from the CelloLab: Reimagining the Instrumental Studio." Invited presentation at 2016 American String Teachers Association National Conference. “A Theory Prof and a Cello Prof Walk Into a Bar.” Paper with Dr. Anna Gawboy presented at 2014 College Music Society National Conference. “Beethoven, 1815: The Master Breaks the Mold.” Recital with Robin Rice and Edward Bak given at Vanderbilt University and The Ohio State University, 2015.